Many are the new features introduced to Android by the 6.0 Marshmallow update. Many of them we've talked about already – Android's latest release brings better control over app permissions, improved power management, native support for fingerprint scanners and the USB Type-C connector, as well as enhanced search features powered by Google Now on Tap. But for every major Android 6.0 feature, there's probably a dozen minor ones that we may have not mentioned yet. One of these minor features is the new, built-in file manager. 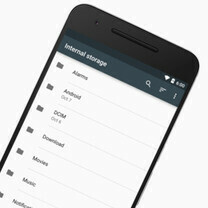 And now you should be looking at Android 6.0's on-board file manager. True, it feels crude compared to most third-party options. It can't rename files, it can't cut files, and it can't make new folders, to be more specific. But it gets the job done for some other basic tasks. The manager lets you copy files around, it can sort them in a specific order, and it lets you share them via other apps. There's also a search function if you're looking for a specific file that you know the name of. So, do you like this handy Android 6.0 trick? Do you think you'll be using it often? Let us know in the comments! ES file explorer is my bread and butter app First app I would install into any devices. So happy they implemented this. Third party apps are already tons better, but having this helps for a quick easy checkup on your android system. I love the chromecast plugin for it. Why must Google bury important features deep inside the settings app?